May of 2018 was the sixth wettest May on record in the greater DC area with 8+ inches of rain recorded throughout the area. With June keeping up the pace, we have seen more than our share of soggy basements and other rain-related issues. Cleaning up after a water emergency can get quite pricey, and depending on the source of the water (flood from outside vs. flood from inside) your insurance might not cover any of the costs. 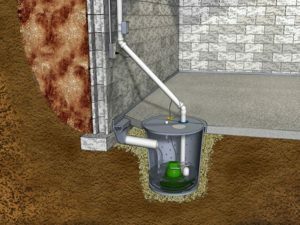 Test your sump pump monthly – most basements have a sump pit that collects ground water from around the foundations and then pumps it safely away from the house. Typically they look something like the image below. The pump will have a float on it that turns on as the water rises. If you can reach into the pit, you can lift the float manually to see if the pump kicks on. Otherwise, you can pour water into the pit until it raises the float all the way. If the pump does not kick on then you should have it serviced or replaced immediately. Check your gutters and downspouts – the easiest way to do this without climbing on a ladder is to grab an umbrella and take a walk around the outside of your home during the next heavy rain fall. If you see water pouring over your gutters that means they are clogged and need to be cleaned. If too much water pours down near the foundation of your home it can cause enough hydraulic pressure to force water to seep into the basement through cracks and seems in your foundation walls. Check basement stair and window well drains – The drains around the outside of your home typically tie into your sump pit and form a critical part of your home’s defenses against water intrusion. Clogged drains in these areas often lead to water coming in around basement doors and windows. Remember, insurance companies often do not cover water damage coming from outside (as opposed to a pipe burst or failed sump pump), so be sure to keep these drains clear at all times. By making these simple activities part of your maintenance routine, you significantly diminish the risk of a catastrophic flood in your home. With weather patterns in the region growing more severe all the time, a little prevention becomes critical.